We have something very exciting about to happen here at Emmaus....... Keep reading ( this is straight from Stacey's blog so I can't take the credit for the great writing!!) and find out how you to can be part of what is about to happen. We've been saving it, this first day of school, for something really-big-deal special. 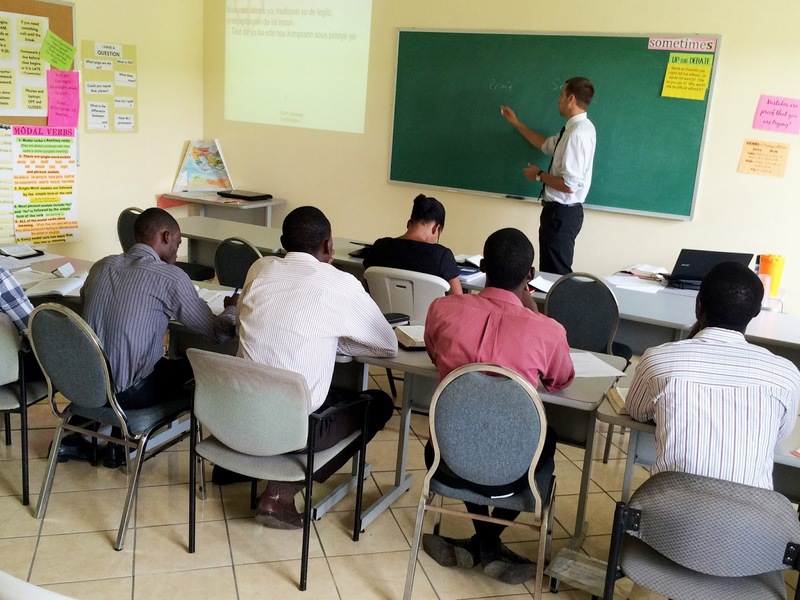 This afternoon, another 35 men and women will join us to continue their education and training with masters classes, half in Biblical Principals for Teaching class, and the other in Doctrine of Humanity and Christology classes. 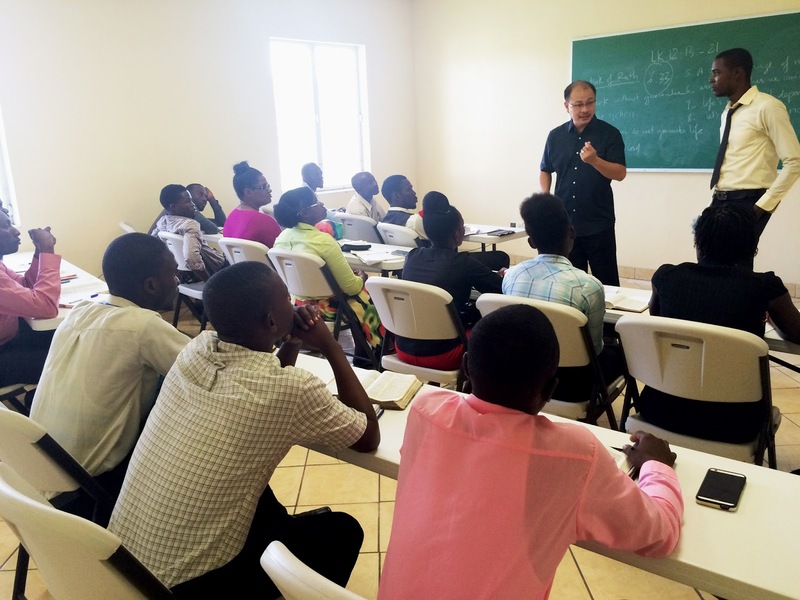 Haiti ultimately has a major sin problem. And the sin problem, it destroys and kills. That's what you see here, that's what the world sees here. That's what we see in America, that's what we see everywhere. And we're here, our staff of 20 with a dozen regular visiting professors, is here, giving all our lives to meet that problem full-on with the only solution : an only Savior through whom true redemption comes. We're modeling Him. 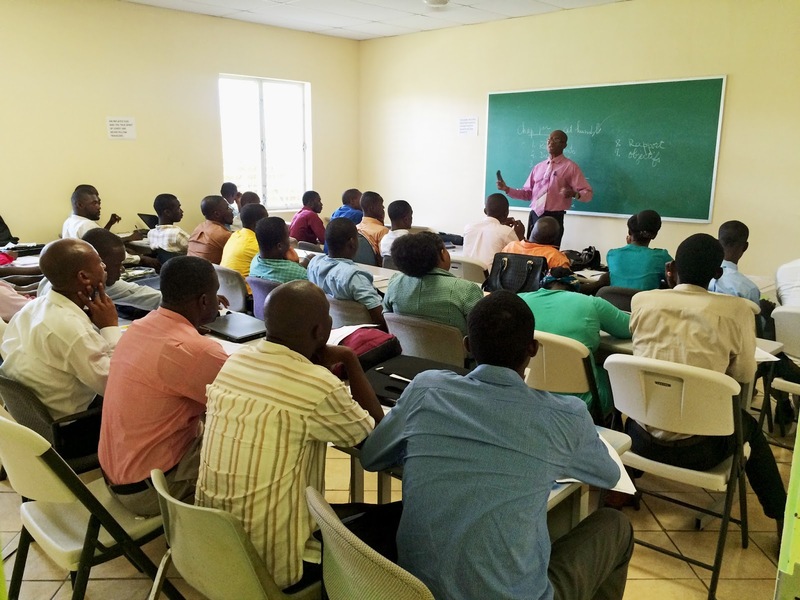 We're teaching Him, we're studying Him, we're drawing near, and we're doing all we can to give Him all we can to 100+ students, who are in turn continually teaching Him, studying Him, drawing near, and doing all they can to give Him all they can to ten of thousands throughout Haiti. There are many many symptoms our great sin problem produces. The needs are great and many and deep and wide. And every time God points one of them out and fans a flame of passion and conviction in any one of us, EBS does all it can to equip he or she who is needed and called, to fill their hands with what is needed and practical. And until today, that has included sending and serving just about all OVER the place in Haiti. And there is still much-much to do, and today, praise the Lord, we are on it. But a few months ago, a trusted ministry partner who has helped teach our "Islam and the Christian Faith" classes in the past sent us an email, "URGENT". We watched this 3 minute video he sent us. Paul told us that 100,000 refugees from North Africa have been arriving in Sicily each year, exactly what you see in that video. You've heard why they're leaving...horrific civil wars, horrific injustices, horrific living conditions, horrific threats of human trafficking, horrific like we don't understand. The kind that makes you depart Libya and put your toddler in an unsafe, overcrowded wooden boat that everyone onboard knows often capsize, and head to who.knows.what.maybe.something.better. 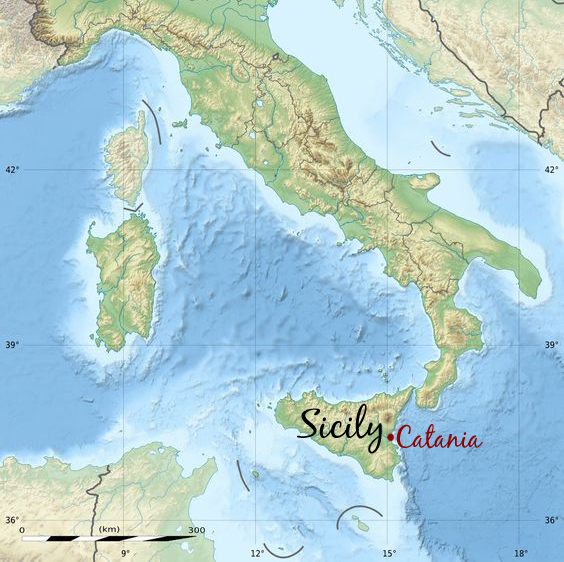 If they are saved by the Italian coast guard, they are brought to Sicily. And put in housing, for one to two years, waiting for their paperwork to be processed. To get a work permit. Many speak English, but the many from West African nations such as Mali, Senegal, Guinea, and Cote d'Ivoire do not. As reality would have it, they come from countries that have the EXACT same problem Haiti has. America has. Canada has. That same sin problem that rampantly destroys and kills. They need housing, they need work, they need medical care, they need a safe place. And praise the Lord, Italy is working over-time, every moment, to provide that, especially the port city of Catania in Sicily, where some 2/3rds of refugees coming to Italy go. Our partners are working there through an association of Sicilian evangelical churches and missions agencies partnering under the banner of "Care for Catania". They know the GREAT need, and have a vision to start a discipleship making movement among Muslim-background refugees on the island of Sicily, and the need is very unique. Missionaries who speak French, and who have similar cultural backgrounds are desperately needed to connect with the French-speaking Muslims from West Africa in Catania. That's Emmaus. Emmaus is overflowing this morning (right here, 10 feet from me, look at those pictures above) with missionaries who speak French, with similar cultural backgrounds and understanding to the desperate men and women flowing from West Africa to Catania. Do you have goosebumps? 'Cause I have goosebumps. And everytime God points one of them out and fans a flame of passion and conviction in any one of us, EBS does all it can to equip the he-or-she who is needed and called, to fill their hands with what is needed and practical. TODAY, today that means that Emmaus is sending two of our missionaries, two of our very, very best. And I've gotta say I kinda hate sending them, because they're fourth year students, and when it comes to brains and when it comes to heart and when it comes to character they are our BEST. Which is exactly why we are sending them, and exactly why they are AFLAME and passionate and ready to go. 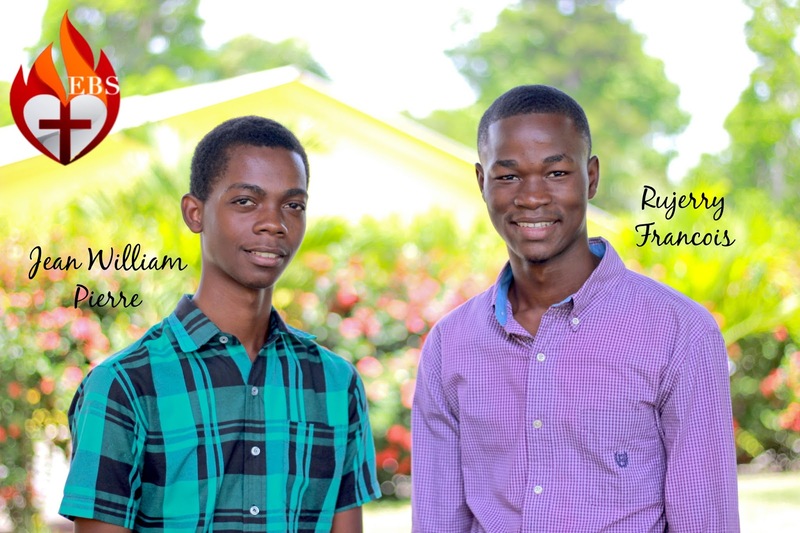 Jean William and Rujerry are in great need of your prayers. They will be taking two classes this next four weeks, one of them specialized in sharing the Gospel with Muslims, and we plan/hope/pray to send them mid-September for Catania. A fabulous gift that came from Matt's time at Eaton Rapids paid for HALF the entire trip, but we are in great need of more help to get them both funded in time to go mid-September. Jean William and Rujerry have been traveling church to church throughout Haiti all summer, raising support and prayers from churches in Northern Haiti, and now we are coming alongside to help them finish. But it IS Jean and Jerry, and we feel that Emmaus has a responsibility to send them. If God's made or making this burden YOUR burden, please help us find the last $5000. Please commit to praying for these young men, praying for Sicily, praying for the hundreds of thousands of refugees around the world. Please share this post with friends and families and churches who will help and pray and KEEP praying. You can give now lots of ways here. Mark it ITALY. Heavens, send the $20 in your wallet in an envelope. Post-note it ITALY. If you have any questions, EMAIL me, and I will find the answer. I'll be keeping you up on their preparation, trip, funding and outreach throughout the semester here. As always. I never stop. writing. As you know. What has gripped me most is Jean William and Rujerry's hearts...to go to a place they've never been to a people from another place they've never been, to freely and finally give them Jesus while they're getting the precious help that they need...In a place where they can finally freely hear about Jesus. I'm overwhelmed by that. This is a great risk, a great inconvenience, a great discomfort, that deeply inspires and blesses my heart. It's what we're asked to do in Haiti, it's what we're all asked to do in the world. But what gripped me as much are the faces of the people on these boats, and the great risk, the great risks they are taking. One of the Italian rescuers explained it well..."They have nothing to lose, which is...is terrible to understand." I don't. I don't understand that. But I DO know, dearly, Who it is they have to gain, the WHO that changes e-v-e-r-y-t-h-i-n-g.
And if Jean William and Rujerry are going, they WILL SEE HIM. Want to know whats going on? Do we really know better?